A YOUNG boy from West Belfast is doing his bit to raise money and awareness for muscular dystrophy. Nine-year-old Sean McKinney from Cullingtree Road is walking to raise funds for Muscular Dystrophy UK. Sean was diagnosed with muscular dystrophy just before Christmas 2010. Speaking to the Andersonstown News Sean’s dad Sean senior said: “The walk is called ‘move a mile for muscles’. When Sean was diagnosed it came as a terrible blow to his family, but he has adapted quickly as have his family. 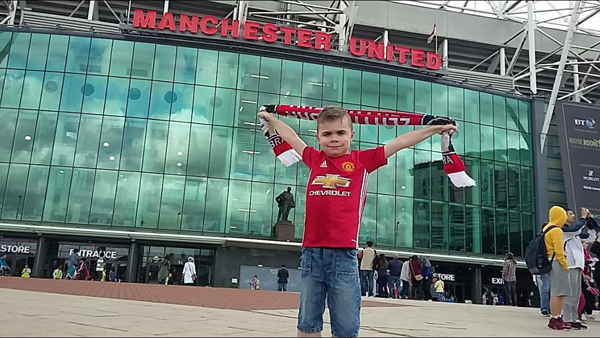 Young Sean is an average nine-year-old who loves to play outside and watch his beloved Manchester United, Barcelona, Celtic and Cliftonville matches with his daddy. “He doesn’t do PE in school,” said Sean senior. “But Disability Sports NI are starting to introduce wheelchair sessions into his PE classes in St Peter’s Primary School. I think it’s great, it ensures that Sean is included and it also raises awareness with his classmates. “I’ve always raised money for muscular dystrophy charities then I saw this ‘move a mile for muscles’ walk. I asked Sean if it was something he might want to do and he was all for it. Sean will be moving a mile for muscles on Friday September 9 in Ballymoney. If you would like to sponsor Sean and his very worthwhile cause simply log onto www.JustGiving.com and search for Sean McKinney.